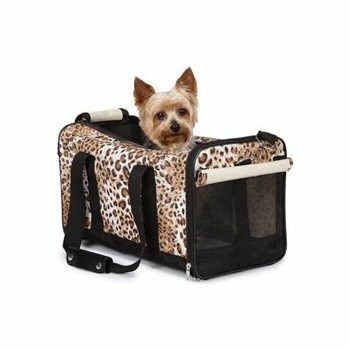 Fashionable and stylish Cheetah dog Carry Bag. Eye-catching all over animal print on a nylon canvas body. Can be carried over the shoulder or in hand. Bags feature zippered openings on the front and top. Roll-back privacy flaps over mesh windows. Zippered storage pocket and a removable Berber mat. Holds pets up to 22 lbs. Dimensions: 17.5″ H x 9.5″ W x 18.5″ D.